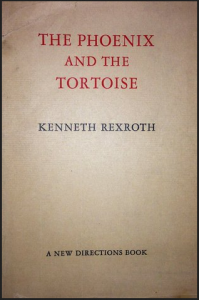 For the exciting tale of Rexroth’s turbulent Hoosier upbringing and the mischief he got into along the way, see part one: The Midwestern Making of Kenneth Rexroth. 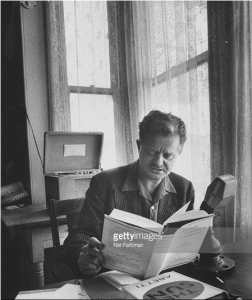 Kenneth Rexroth, Portrait of Andree Rexroth, accessed Linda Hamalian, A Life of Kenneth Rexroth (New York and London: W. W. Norton & Company, 1991), 122. 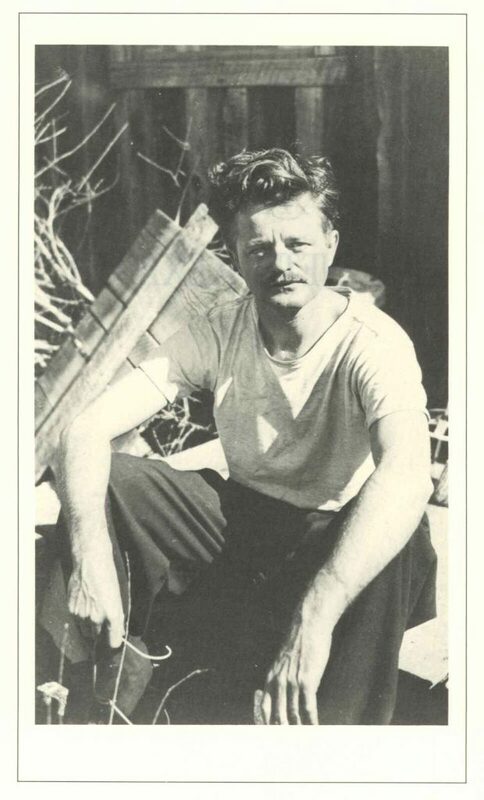 After a period of hitchhiking their way towards the West Coast, camping, and living on cold food, the twenty two-year-old burgeoning poet Kenneth Rexroth and his new artist wife Andrée, arrived in San Francisco in the summer of 1927. Rexroth biographer, Linda Hamalian, referred to them as “forerunners of the flower children who flocked to Northern California during the fifties and sixties.” In San Francisco they found exactly what they had been hoping for: a rich cultural environment without the pretense they sensed in the East Coast artistic community. 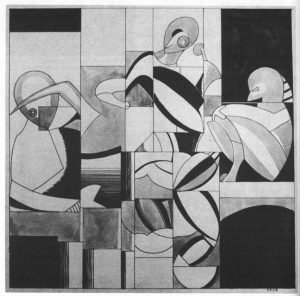 Andree and Kenneth Rexroth, “Bathers,” oil on canvas, n.d., accessed Linda Hamalian, A Life of Kenneth Rexroth (New York and London: W. W. Norton & Company, 1991), 120. My poetry and philosophy of life became what it’s now fashionable to call ecological. I came to think of myself as a microcosm in a macrocosm, related to chipmunks and bears and pine trees and stars and nebulae and rocks and fossils, as part of an infinitely interrelated complex of being. This I have retained. 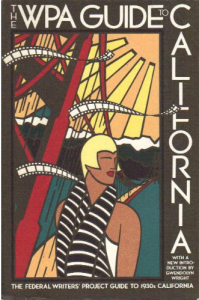 Reprint of the WPA Guide to California (Pantheon Books, 1984) accessed Amazon.com. By the 1930s, in the midst of the Great Depression, Rexroth was employed by the Work’s Progress Administration (WPA) contributing to the “American Guide” series of handbooks for each state. Rexroth and several other local poets and writers created the California guide and were able to inject information on natural conservation and into the otherwise standard guidebook. Lowered into the graves with the red flags over them. Lowered each in its own darkness, useless in the earth. Mounting over half the world presses against me. James Laughlin, ed., New Directions in Poetry and Prose (New York: New Directions, 1937), photograph accessed via Amazon.com. 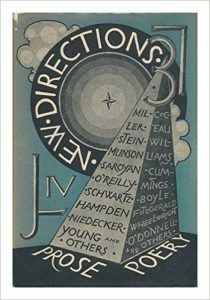 That same year, the influential independent publisher James Laughlin included Rexroth’s work in his second annual New Directions in Poetry and Prose, a publication the Academy of American Poets referred to as “pivotal.” In 1940, Macmillan published Rexroth’s first major collection, In What Hour. The work was considered wholly original and cemented his place at the forefront of the San Francisco literary movement. 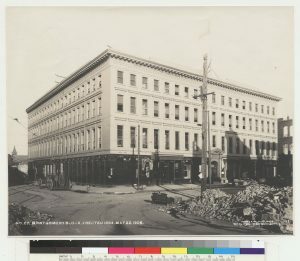 A reviewer for the Oakland Tribune wrote: “Rexroth is wholly and essentially a poet in the new manner. Usually a poet’s first work, and this is Rexroth’s first book, enables the acute reader to name his literary progenitors. But Rexroth’s poetical parents, if he has any, are not known.” The critic continued, “Despite this break with tradition, or it may be, as the apostles of the modern poetry claim, because of this independence, Rexroth’s book is important and tremendously interesting.” Hamalain wrote that the poems that make up In What Hour “demonstrate his remarkable ability to render plausible the possibility of spiritual presence and a sense of unity in the natural world” despite the threats of the modern age. Oakland Tribune, September 1, 1940, 18, accessed Newspapers.com. 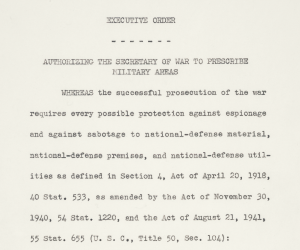 Executive Order 9066, February 19, 1942; General Records of the United States Government; Record Group 11; National Archives accessed https://www.archives.gov/. After the Japanese attack on Pearl Harbor on December 7, 1941, some Americans began questioning the loyalty of Japanese Americans, a large number of whom lived on the West Coast. In February 1942, President Roosevelt issued Executive Order 9066 which relocated Japanese Americans, including native born citizens, inland, away from the coast (which had been identified as the Pacific military zone) and confined them to internment camps. Thousands were forced to leave their homes and businesses. However, some Americans, including Rexroth, opposed internment as racist and unconstitutional. National Archives caption: Posting of Exclusion Order at First and Front Streets in San Francisco, California, directing removal of persons of Japanese ancestry from the first section in San Francisco to be affected by the evacuation. Rexroth wrote in his autobiography that even before the U.S. declared war on Japan, that he worried Japanese Americans would face persecution. He wrote a letter and sent it to various pacifist groups and religious groups, stating that when war was declared, “the persecution of Japanese and Americans of Japanese ancestry, because they are marked by their color and features, will be worse than that of the German-Americans of the First World War.” He wrote in his autobiography, “I managed to persuade them to set up a committee with the absurd title of the American Committee to Protect the Rights of Americans of Oriental Ancestry.” When Rexroth and other members of the Friends Service Committee got word from a “contact in the White House” about the order for internment, they “immediately got on the phones,” and urged each person they called to call five more people. They also called university and political contacts and civil liberties organizations. 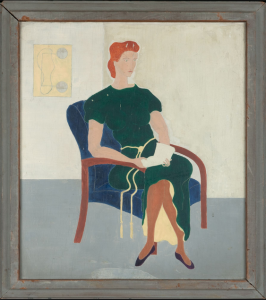 While perhaps an aggrandizement, Rexroth credited this work with mobilizing opinion in the Bay Area against internment. National Archives caption: Waiting for Evacuation in San Francisco, California. With baggage stacked, residents of Japanese ancestry await a bus at the Wartime Civil Control Administration station, 2020 Van Ness Avenue, as part of the first group of 664 to be evacuated from San Francisco on April 6, 1942. Evacuees will be housed in War Relocation Authority centers for the duration. Kenneth Rexroth, The Phoenix and the Tortoise (New York: New Directions, 1944). Just as London under the buzz bombs enjoyed a literary renaissance and a profound change of social relationships . . . so San Francisco during the War woke up from a long provincial sleep and became culturally a world capital. Rexroth also maintained what Beat scholar John Tytell called “a sort of western salon, a weekly literary gathering,” where Rexroth introduced poets to each other and hosted readings. Out of this meeting of minds came “an entirely new cultural synthesis,” which produced new movements in theater, art, and poetry. One newspaper described this literary gathering in 1948 as “the San Francisco bay area poetry forum,” but the broader movement became known as the San Francisco Renaissance. 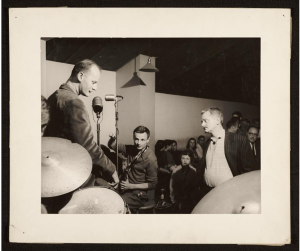 Rexroth considered the combination of political discussion, poetry, and jazz to be the foundation of the movement. Over the following decade, this San Francisco Renaissance ushered in the rise of the Beat Generation. Rexroth’s role as bandleader of the San Francisco movement was responsible for his gaining the title “Father of the Beat Poets,” though he would later reject the title and the movement. 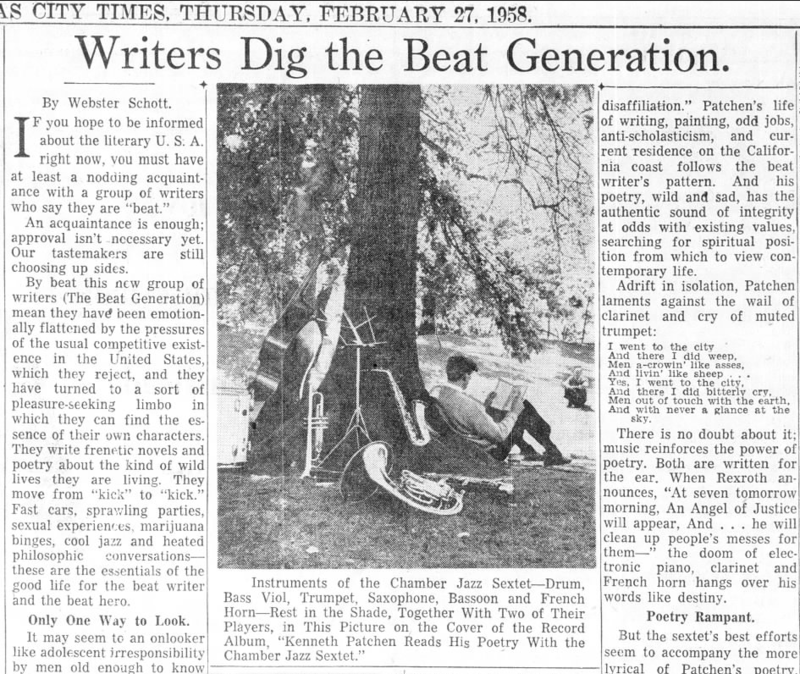 Webster Schott, “Writers Dig the Beat Generation,” Kansas City (Missouri) Times, February 27, 1958, 34, accessed Newspapers.com. Rexroth also helped establish jazz as an essential element of Beat poetry. During this period, Rexroth gained fame for combining his poetry with the music of local jazz groups. 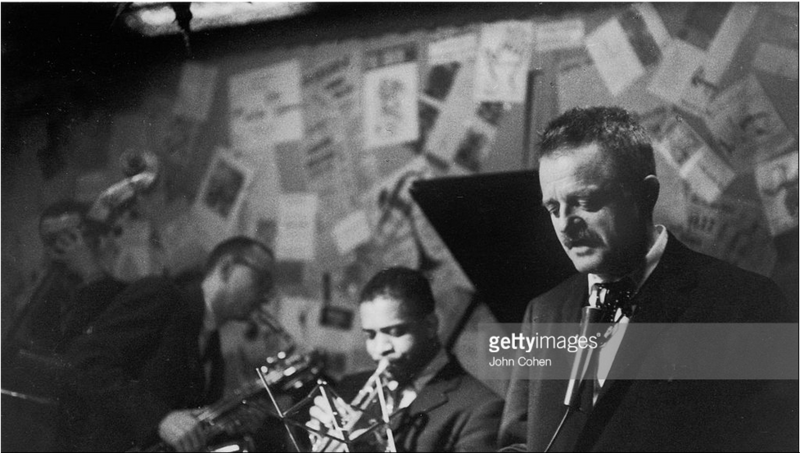 In San Francisco, he often performed at the Cellar, which became known for jazz and poetry performances and at the Blackhawk club with jazz bands like the Dave Brubeck Quartet. Two such performances were released on vinyl in 1957 and 1959. Rexroth was among the first twentieth-century poets to explore the prospects of poetry and jazz in tandem. He championed jazz and its musicians, publishing appreciations of players like Charles Mingus and Ornette Coleman, defending jazz in print against critics who deemed the music less than serious, and most importantly, he played in a jazz band himself, helping to define a role for the poet in the jazz world and a role for jazz in the poetry world. 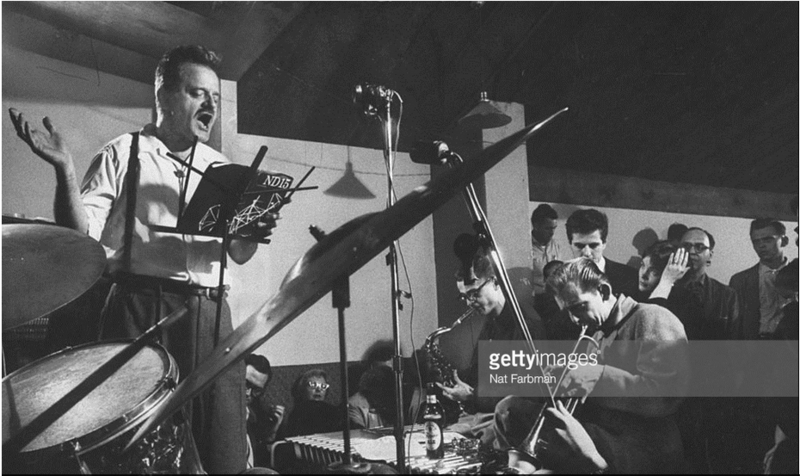 “American Poet Kenneth Rexroth Reads One of His Poems as Three Musicians Play Instruments Alongside Him,” photograph, January 1, 1960, accessed Getty Images. 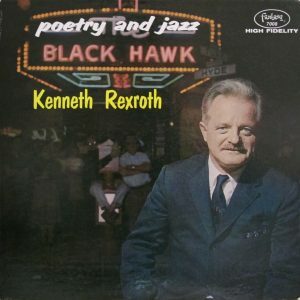 In the liner notes for his 1959 recording Poetry and Jazz at the Blackhawk, Rexroth wrote that jazz poetry “takes the poet out of the bookish, academic world” and returns the poetry to the realm of public entertainment. Rexroth believed that combining music and spoken word connected the audience and poet directly (as opposed to the mediation of the written word) and restored poetry to oral tradition. Mainly, however, it was his rejection of mainstream culture that aligned Rexroth with the Beat movement early on. 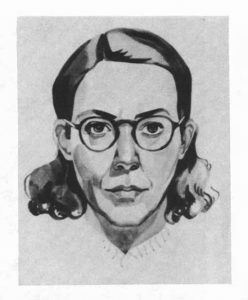 For example, in 1951, in a syndicated review of Rexroth’s poem “The Dragon and the Unicorn” one critic noted that these rebellious writers were reacting to the post-war period with disgust. He stated that though in their writing style, they break with tradition, but their rebellion makes them part of a long tradition of creativity. 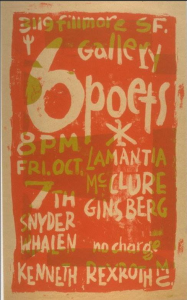 Six Gallery Poster, Allen Ginsberg Project, accessed ginsbergblog.blogspot.com. Poetry readings to large and enthusiastic audiences are at least weekly occurrences – in small galleries, city museums, community centers, church social halls, pads and joints, apartments and studios, and at the very active Poetry Center at San Francisco State College, which also imports leading poets . . . Poetry out here, more than anywhere else, has a direct, patent, measurable, social effect, immediately grasped by both poet and audience. Fred Danzig, “‘Beat Generation’ Got that Way through Draft, Missiles, Hydrogen Bombs, Wars,” (Elwood) Call-Leader, April 28, 1958, 10, accessed Newspapers.com. 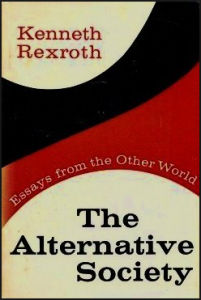 Although the Beat movement melted into the counterculture movements of the sixties and rock and roll became the dominant outlet for rebellious youth, Rexroth remained a central figure in American literature. He continued to write poetry and extensive cultural and literary criticism. In addition to his original contributions, his translations of foreign poetry and his writings on literature such as his “Classics Revisited” column in the Saturday Review increased his importance to the literary world. 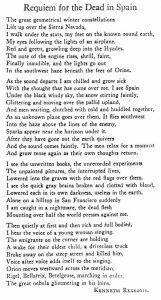 Kenneth Rexroth, The Alternative Society (Herder and Herder, 1970). While Rexroth had begun translating poetry from other languages in the 1950s, he dedicated more and more of his time to the task later in life. 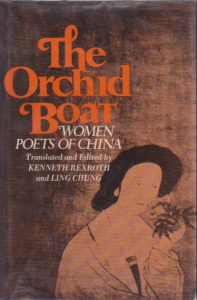 He paid special attention to translating the work of women poets starting in the 1970s in works such as The Orchid Boat: Women Poets of China (1972) and The Burning Heart: The Women Poets of Japan (1977). By this point, his own work incorporated imagery and meter learned through decades of translating Chinese and Japanese poetry. In his review of Rexroth’s collection The Morning Star (1979), critic Emiko Sakurai praised these poems especially as “extraordinary poems, rich and sensuous, always immediate, febrile and powerful” and called Rexroth “a poet of the first rank.” However, Sakurai had a hunch about Rexroth. He noted that “The Love Poems of Marichiko” were “ostensibly” written by a young Japanese woman. Indeed, they were actually written by Rexroth from this imagined perspective. Critics noted the transformative power his work as a translator had on his own original work and his ability to write convincingly from the a feminine perspective of his invented character. 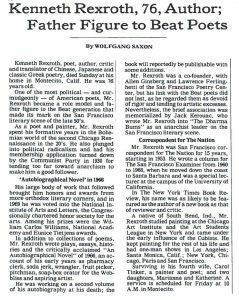 Wolfgang Saxon, “Kenneth Rexroth, 76, Author; Ffather Figure to Beat Poets,” June 8, 1982, D26, accessed ProQuest Historical Newspapers. Upon Rexroth’s death in 1982, the New York Times described this “poet, author, critic and translator of Chinese, Japanese and classic Greek poetry” as greatly influential on later generations of writers. The Times obituary noted that he received acclaim from both radical literary and political circles as well as “honors and awards from more orthodox literary corners,” such as Guggenheim fellowships and a prestigious grant from the National Institute of Arts and Letters in 1964. 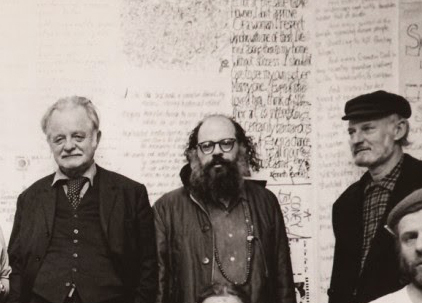 Left to right: Kenneth Rexroth, Allen Ginsberg, and James Laughlin. Image is detail of photo by D. Sorenson, City Lights in North Dakota Conference, March 18, 1974, accessed Allen Ginsberg Project. Ann Charters, ed., The Portable Beat Reader (New York: Penguin Books, 1992).